Here’s more on the opportunities available through our Property Services. We provide a wide range of grounds and gardens maintenance services across the Perth Metro region. Our teams operate from Mandurah and Midvale and specialise in weeding, watering, pruning, and mulching. They also do garden installation and seasonal management. Employees learn many techniques in order to ensure the property is well maintained all year round. Both teams have a supportive staff and are managed by two passionate supervisors with plenty of experience. Property Services Manager Craig is based at Midvale and enthusiastic about providing his team the knowledge needed for future career development. And Mandurah Supervisor Sue is there to encourage everyone to try their best and take pride in their achievements. These tasks are performed regularly to maintain a garden or property in the long-term. You will be trained by qualified staff to use tools to assist with garden maintenance. Employees start with hand tools and rakes, and after that move onto power tools like hedge trimmers, brush-cutters, chainsaws, and lawn mowers. Employees set and monitor reticulation systems and repair any faults or damaged sprinklers. Team members learn to identify different plants and weeds. In addition to this, some are trained and licenced in herbicide application with the Department of Health. 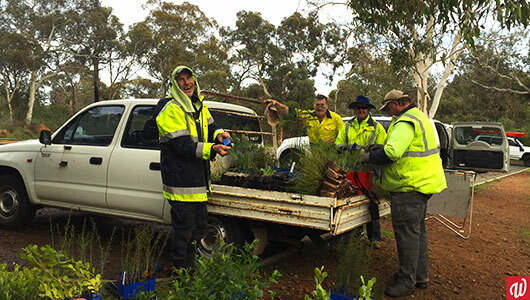 At Property Services, employees learn industry techniques and work alongside horticultural experts which can lead to further qualifications. But regardless of career goals, our team work together to support one another. If you’d like to be a part of our team then get in touch with us today! Contact Teresa at 1800 610 665 or via email. Please note that these articles do not correspond directly to open positions. To find out more please contact us.